The perfect ornament for grandparents or large families. 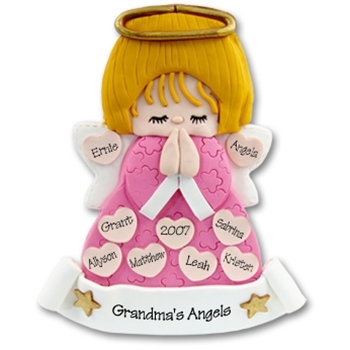 It can accommodate up to 9 names on the angel and the message of your choice on the banner. This ornament is hand made from polymer clay by Debi Allison. It is a limited edition ornament and there are only a few available. Comes complete with hook and satin ribbon for hanging. All ornaments are designed and copyrighted by Deb & Co.